We all know that a healthy diet is essential for our body going, similarly there are certain brain foods which keep our mental motor running. These foods in your diet on a regular basis may reduce the risk for brain and heart diseases and will boost your chances of maintaining a healthy brain for your whole life. Whatever we eat, can affect the working of our brain. Find a list of best brain foods to boost memory and concentration. Best brain foods are considered that can boost memory and maintain a healthy brain. The memory improvement foods or known as superfoods involve vitamin B12, vitamin B6, vitamin C and vitamin E, other antioxidants and healthy fats, deficiencies of which cause brain impairment. Both the healthy fats and vitamin E may help keep the heart and brain healthy and their functioning properly. Antioxidants stimulate the immune system and protect the brain from the oxidative damage associated with age-related memory loss. “... diets that are high in healthy fats, low in saturated fat and trans-fats, and rich in whole grains, green leafy vegetables, and nuts are good for the brain and the heart,” says Maria C. Carrillo, PhD, senior director of medical and scientific relations at the Chicago-based Alzheimer’s Association. In a series of mental exercises such as memorizing words and mental arithmetic, the top performers of the people of 65+ age were those who consumed the most fruits and vegetables (health benefits of fruits and vegetables) and ate the least saturated fat, as reported in the American Journal of Clinical Nutrition. The research has shown that berries may help preserve the brain’s natural “housekeeper” mechanism, which weakens with age. The more colourful they are, the better in their antioxidant capability (Antioxidant rich foods). The antioxidants in them protect the brain from the damage of free radicals. 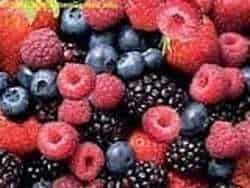 The rich antioxidants in deep red and purple pigments of fruits and vegetables protect brain cells, discourage the formation of blood clotting and promotes healthy blood flow. Eat daily plenty of antioxidant fruits such as blueberries (Blueberries nutrition facts), blackberries, strawberries, raspberries, cherries, jambu fruit (Jamun), oranges, Pomegranate juice, raisins and red grapes, and antioxidant vegetables such as alfalfa sprouts, beets, broccoli, Brussels sprouts, garlic, plums, red peppers, spinach, tomatoes (growing tomatoes in pots) and tea. Avocado: Eating avocado, like blueberries, is a rich source of the antioxidant vitamin E and vitamin C may promote brain health and lower risk of developing Alzheimer’s. Tea: Drinking 2-3 cups of freshly brewed tea a day gives you caffeine which in small amounts can boost memory and focus. Dark chocolate: Dark chocolate has powerful antioxidant properties and contains caffeine, which enhances focus and concentration and mood. But eat only in moderation, 10-25 g.
Whole Grains: Whole grains like beans are high in antioxidant ability and high in fiber so they stabilize glucose levels in blood. Since brain is dependent on glucose for fuel but it cannot store it, so it depends on a steady stream of energy. Dark green leafy vegetables such as spinach, broccoli, collard greens and Kale are good sources of vitamin E, vitamin C, betacarotene and folic acid that keep blood vessels supple and help transport nerve impulses efficiently. The folic acid may protect the brain and heart by lowering levels of homocysteine in the blood. The homocysteine in blood may trigger the death of nerve cells in the brain. Our brain needs a good amount of Omega-3 to be consumed to repair and grow additional neurons. Nuts and seeds are packed with these healthy fats and vitamin E.
Eat about 25 g daily. Nuts such as walnuts, hazelnuts, almonds, cashews, Brazil nuts and peanuts, and seeds such as sunflower seeds, sesame seeds and flax seed are good. They contain omega 3 & 6 oils which are good for brain and memory improvement. The other good sources of these healthy fats are wheatgerm, salmon, tuna and eggs. Chewing 7-8 almonds daily can improve memory. Soak 10 almonds in water overnight. Remove the skin, grind them and boil it with a glass of milk. Drink the milk daily. Some of the brain foods you can grow in your garden.